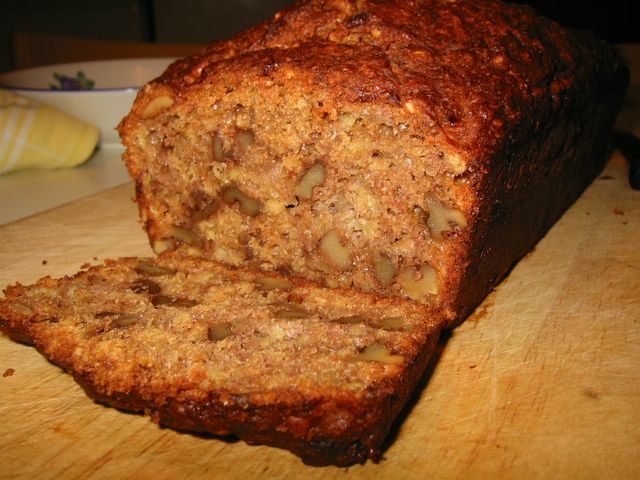 Bear with me, I have to include all the recipes I have for using up overripe bananas. Here is another loaf-shaped bread to have with your afternoon tea. It was firm and thus deserve its name 'teabread'. Not too sweet plus the wholesome goodness of wholemeal flour and oatmeal were included. The latter two made it quite filling after only a few slices. I adapted this from my latest cookbook love - the BBC Goodfood Magazine's 101 Cakes and Bakes. Preheat oven to 180°C/fan 160°C/350°F/Gas Mark 4. Butter the bottom of a 1kg/2lb (9 x 5-inch) loaf pan. Mix all dry ingredients (flour, oatmeal, baking powder, and cinnamon) in a bowl. In another bowl, cream/beat butter and muscovado sugar. Add the eggs and continue beating. Add the mashed banana, mix. Add in the dry ingredients. Mix until well combined. Pour into the prepared loaf pan and bake for 1 1/4 hours or until a skewer inserted in the middle comes out clean. You may cover the cake with foil halfway through the baking to avoid burning the top. Allow the bread to cool for 5 minutes in the pan. Turn out and cool completely in wire rack.